Welcome to the Mystic Oaks Family and Cosmetic Dentistry blog! 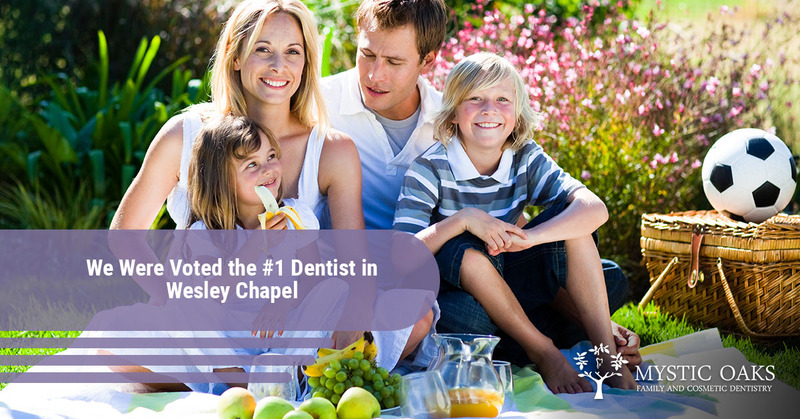 We are excited to announce that the people have spoken and we were voted the #1 dentist by the people of Wesley Chapel! Dr. Prematee Sarwan and her staff have always been dedicated to providing quality care to their patients. For them, addressing each patient’s needs entirely is non-negotiable, and we are excited to be recognized for our dedication to quality dental care. There are a lot of reasons why we hope that you’ll stop searching for “dentist near me in Wesley Chapel” and make an appointment with us. However, today we will just name a few of the reasons why Wesley Chapel loves Mystic Oaks Family and Cosmetic Dentistry! There are a lot of reasons why you might choose one dentist over another, but here are a few reasons why our patients love Dr. Sarwan and her dental office. Some patients look forward to coming to the dentist; they love the feeling of a clean, fresh smile and don’t mind the cleaning process. However, there are those who don’t; their sensitive teeth make the experience painful, and their anxiety about their visit to the dentist can be extreme. Everyone needs dental care! As a gentle dentist we offer what you need to relax at our office and provide a means for pain relief. Learn more about what a gentle dentist offers, or give us a call. We would love to accommodate you! We’re all busy and are just trying to mark one more thing off of our to-do list. Nothing is more frustrating than a task that takes longer than need be. For this reason, we offer quick, efficient, and effective appointment scheduling! No matter if you contact us online or call our dental office, you can expect to enjoy customer-focused attention and easy scheduling. There are many that don’t have access to dental insurance and can’t get the dental care that they need. Dr. Sarwan wants to provide a better way with our Dental Savings plan and regular specials. With our Dental Savings Plan, you get access to regular cleanings and even discounts on cosmetic services! Everyone can get the dental care that they need at an affordable price! People love our state-of-the-art facility! We have cutting-edge technology to provide the best, most advanced care. We also offer conveniences such as TVs that you can watch during your cleaning. Whenever you come into our office, you can expect to enjoy the best of the best at an affordable cost. Our dentist and her team of hygienists, and office managers, truly care about our patients and do everything that we can to exceed your expectations during your appointment. No matter if you are coming in for a regular cleaning, calling our office with questions, or are investing in your smile, you can always count on patient-focused care! To learn more about Mystic Oaks Family and Cosmetic Dentistry and make an appointment, visit our website. There you can learn more about our $39 New Patient Special & New Year, New Smile Special. Stop searching “dentist near me” and come visit us in Wesley Chapel!